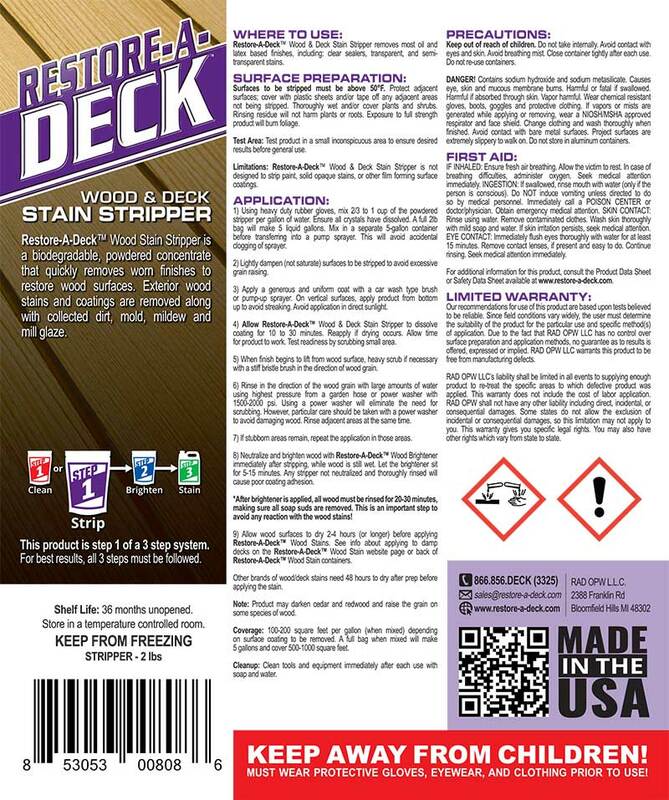 Restore-A-Deck Stain Stripper is the only concentrated powdered wood stain stripper that is specifically designed to be injected through a pressure washer. RAD Stripper may also be applied using a garden type sprayer. 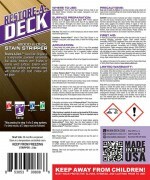 The R-A-D Stain Remover, when injected using a pressure washer, can remove penetrating transparent stains as well as semi-transparent wood coatings. When RAD Wood Stain Stripper is applied using a pump-up sprayer, it is twice as potent and able to remove most transparent, semi-transparent and even semi-solid wood stains. It is also excellent for getting rid of failed semi-transparent acrylic stains. Coverage rates when applied with a pump sprayer are 100-200 sq. ft per gallon. 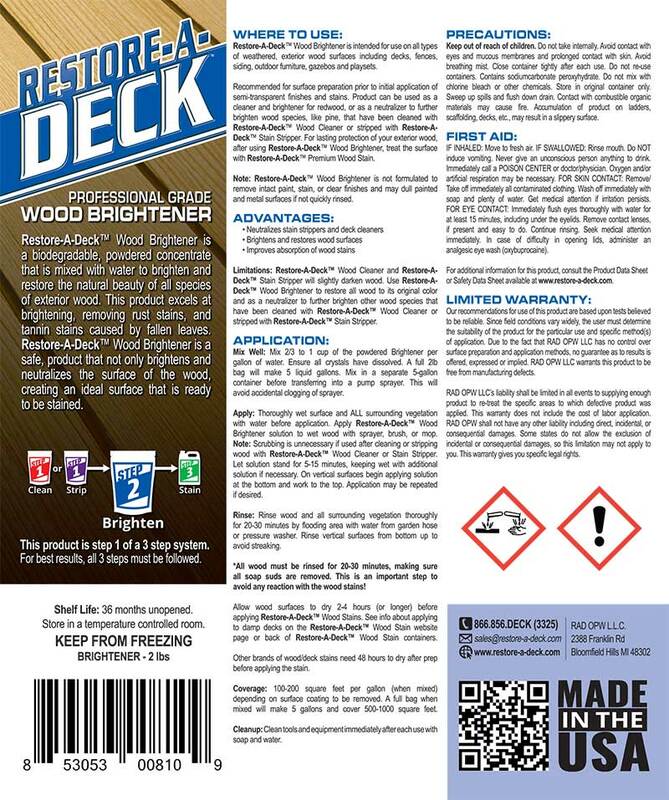 After using Restore-A-Deck Injectable Stain Stripper, the wood needs to be neutralized with the RAD Step 2 Brightener. 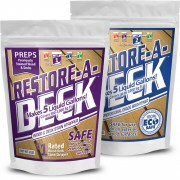 Use the Restore A Deck Stripper kit for removal of old transparent and semi-transparent coatings. I have an older, pretty weathered 1,200 sq ft deck that I have just finished resurfacing by sanding.....uhg! Do I need to use a cleaner, brightener or other product before applying a stain (thinking semi-solid)? Will these products kill plants if over spray lands on them? It may burn them if you overspray and do not rinse right away. Do I still need to use the cleaner in conjunction with the stripper and brightener? No need to use the cleaner if using the stripper. Brighten after. Can you wood stripper be applied with a shurflo 12v pump? I have 10 yr old pressure treated lumber deck. It has solid stain on it which some area chipped and pressure washed down to bare wood. Do you have a stain that would cover to leave a one color appearance? With 500 + sq ft of deck plus stairs plus raining it seems pretty overwhelming to think about stripping. Any suggestions? No you cannot apply the AC over a solid stain nor can a solid stain be stripped off. No it is not harmful to vinyl. 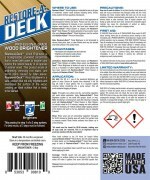 I'm redoing a 25+ year old redwood deck and plan to use A/C product. I just ordered A/C stripper/brightner to remove the last stain applied. I intend to sand to smooth out the wood, then strip/brighten. I just looked up the last stain I applied on this deck and it is Behr solid color wood stain, applied about 3 to 5 yrs ago. It quickly peeled on most of the horizontal surfaces. So my question: should I still use the A/C stripper or use a Behr stripper to remove the solid color stain? and then can I still use A/C brightener or should I also use the A/C stripper even after applying the Behr stripper? Thanks! Neither will remove a solid stain completely. You will need to sand off a solid stain. I just bought Restore A Deck Stain Stripper. On my shingle roof, i have a roof vent of cedar wood i want to apply the stripper on. Will the shingle roof be affected by the stripper ? Will it dammage it ? No it should not harm the shingle roof. I used your redwood tone stain a little over a year ago - it looks great - terrific product. I'm planning to clean it with the RAD cleaner and apply a light maintenance coat of the stain. I'll also be cleaning and staining a newly constructed redwood deck. Do you sell the RAD cleaner by itself? I'd like to buy a 5 gallon redwood tone stain and two packages of the RAD cleaner online from you. Sorry but we only sell it in the kit from this website. We have a deck that was built 3 years ago and stained with TWP. The TWP is gone on the horizontal surfaces, and on the vertical surfaces that get the most sun. I am planning to refinish it with your Amber semi-transparent. To prep, should I use RAD stripper on the entire deck, or RAD cleaner on the parts where the TWP is gone and stripper only where the TWP remains? Or is cleaner enough for the whole thing? Stripper on all, pressure wash, brighten when done.